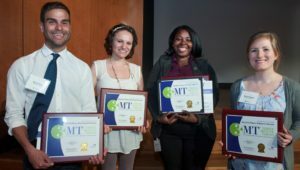 Georgia State University Library was pleased to partner with the Office of the Associate Provost for Graduate Programs to sponsor the University’s 1st Annual Three Minute Thesis (3MT™) Competition. Six Master’s students and six Doctoral students competed in the final round on Monday, March 26, 2017. Dean of Libraries Jeff Steely served as one of three judges. Hosted by research universities in more than 19 countries, 3MT is a research communication competition. Students have three minutes to present compelling orations on their thesis or dissertation topics and their significance. For the list of winners, to learn more about the history of 3MT, and for more pictures from this year’s event, see the 3MT page on the Graduate Programs site. This entry was posted in For Graduate Students, General News, Graduate Student Publications and Research, Publications and Research. Bookmark the permalink. One Response to Congratulations to 3 Minute Thesis Finalists and Winners!